I was again invited to contribute a painting to this year's Beaux Arts Auction. ​I donated "Joyful", 10x10 oil on linen panel. 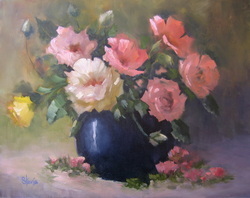 The school will accept online bids for the auction at https://scottsdaleartschool.org/gallery-types/beaux-arts-gallery/. I won Artist of the Month for September 2018 with my entry in the Gilbert Visual Art League's summer challenge. The challenge was to do a painting with a "found object". A bird nest had fallen from a ledge over our garage, so I recovered parts of the nest, broken eggs and even a feather to include in my painting. Different from my normal work, but lots of fun. You can view a larger image in my Daily Paintworks Gallery at ​https://www.dailypaintworks.com/fineart/stevie-denny/what-happened/703068. My painting "Forever on Wheels" (13x10) was awarded Honorable Mention in the Watercolor Division. I painted this as a gift for my son. He's been constantly on the move since he learned to walk. 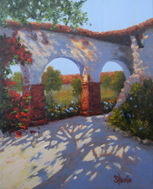 My painting "Limones y Laton" (12x16) was awarded first place in the Oil Painting Division. I was again invited to contribute a painting to this year's Beaux Arts Auction at Scottsdale Artist's School on Saturday, November 12. I'm happy to say my painting sold. I was again invited to contribute a painting to this year's Beaux Arts Auction at Scottsdale Artist's School on Saturday, November 14. I actually donated two paintings, and I'm happy to say that both sold. This is the school's largest fund-raising event, and I'm pleased to donate to this cause. Awarded GVAL's Artist of the Year for 2014, for my "Mission Courtyard 2" painting, selected from Artist of the Month winners. First Place, Watercolor Division: Sky Dreamer, 14x11 watercolor painting -- awarded First Place in watercolor division, Gilbert Visual Art League Annual Show. Artist of the Month for February 2014 by Gilbert Visual Art League, for my Mission Courtyard 2 painting. Collection the Artist. "Hydrangeas en Blanc", 16x20 oil on stretched canvas.